Friday 22nd November 2013 to Sunday, 5th January 2014 (closed on Christmas Day)10am to 10pm every day (on 22nd November 2013 only - opens at 5pm). Tickets On Sale Now for Ice Skating, The Magical Ice Kingdom, Giant Observation Wheel & Zippos Circus. Returning for six exciting weeks of winter festivities with FREE admission there will be even more entertainment and new attractions than before. PWR Events and The Royal Parks are thrilled to announce the main attractions that will be making a welcome return to Capital's most popular and dazzling winter event. The Magical Ice Kingdom will return with more breath-taking ice sculptures. The largest of its kind in the UK and created especially for Hyde Park Winter Wonderland this awe-inspiring experience will take you through a fantastical world of real ice and snow. For those who want to gaze at the action from above, the iconic Giant Observation Wheel will illuminate the skyline. 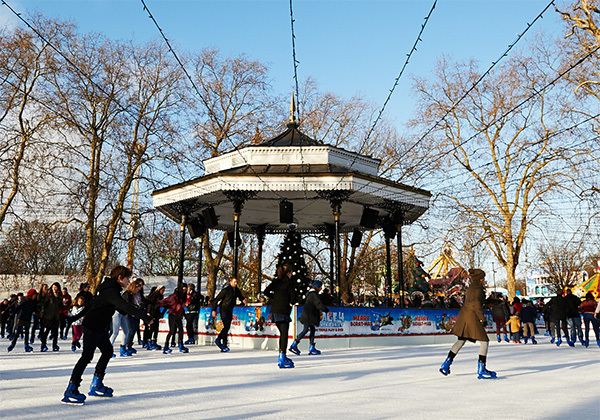 The Ice Rink will once again be located around the picturesque Victorian Band Stand, on which there will be live music played throughout the day and night as skaters take to the ice for a spin. 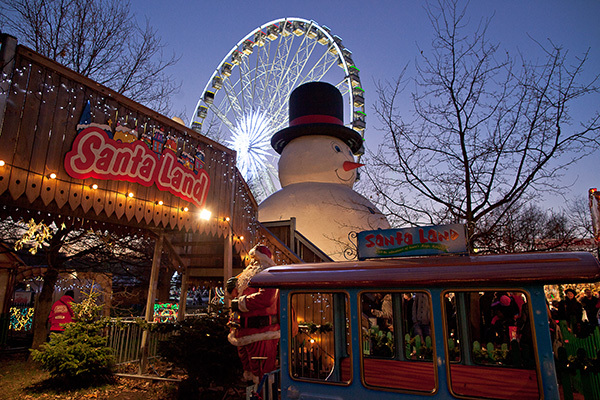 Other favourite attractions making a welcome return include Santa Land, a haven for young visitors with many exciting new rides and attractions as well as Father Christmas, who will be there everyday with a sack of gifts. There will also be over 200 chalets in the beautiful Angels Christmas & Yuletide Markets offering unusual and handmade gifts and crafts, including ceramics, candles, jewellery, wooden toys, nativity scenes and Christmas decorations. Following a sell-out run last year, the UK's favourite circus, Zippos Circus will make a welcome return. Zippos will perform two different shows - the every popular daytime show for all the family, Zippos Christmas Circus and an evening show for older thrill seekers, Zippos Cirque Berserk. Back by popular demand, the Zippos VIP boxes will be available to hire for Cirque Berserk, where you can watch the show from the comfort of your own private box, with a bottle of champagne and delicious chocolates, which are all included in the price. Always quick to sell out, Zippos Christmas Circus is a perfect treat for all the family. A mix of colour, comedy and thrills, starring world-class jugglers, clowns and aerialists, the show is fun-packed from start to finish and at 50 minutes is the perfect length for little ones. For the evening crowd Zippos returns with, Cirque Berserk a very contemporary circus thrill show with strange characters, knife-throwing, fire, ultimate High Wire, sensational Wheel of Death and much much more! Cirque Berserk goes where no circus has gone before. The awe inspiring Wheel of Death, a beyond-thrilling spectacle starring two extraordinary acrobats spinning together in an unbelievably small steel wheel, a death defying knife throwing act, and a daredevil high wire act will leave you on the edge of your seat. The ever-popular Bavarian Village will be ready to serve even more bratwurst and mulled wine whilst hosting live music throughout the day and evening. In addition, to the many restaurants and bars there will be delicious food available throughout the attraction to help you warm up on a cold crisp winter's day. And for those thrill-seekers, there will be an array traditional and high energy rides. So book early for the Ice Skating, The Magical Ice Kingdom, Giant Observation Wheel and Zippos Circus to avoid disappointment and discover what 12 million visitors have already enjoyed.